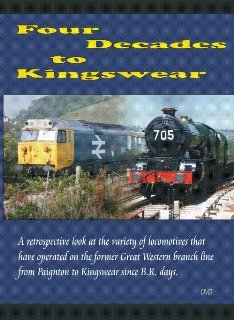 Released January 2007 is a 90 minute long look at the variety of steam and diesel traction that has operated over the Paignton to Kingswear branch since 1973. As well as the beautiful scenery on the 7 mile stretch between Paignton and Kingswear, we see views of some of the specials en-route to their destination, thus high speed runs also feature. An amazing array of 80 different steam and diesel locomotives appear in this programme, some in several locations. The motive powers ranges from 25223 on weedkilling duties to Western Class diesels arriving on the line and in traffic, Deltics & 50s on local workings and Kings, Castles and A4s on mainline specials. "Very impressed by the film quality which was superb, and the commentary was informative but not 'over the top'.